This year is the 25th Anniversary of many great games and this update pays tribute to a few of them. I planned to have separate updates for them, but that big commission a few months ago forced me to condense them into this chunky tribute. To make it worse, a cold I caught right before Christmas robbed a few more days of work out of this update as well. Still, between this and the Mega Man NES-style screenshot generator I posted a while ago, I hope this is a worth tribute to 1987. Fake Screenshot: Rush, Eddie, a new Mega Man edit based on an MvsC win pose were added I also added more edits since the December 17th update. 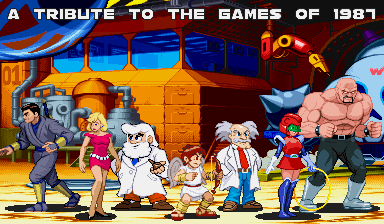 Vs. Maker & GroupShot: Dr. Light, Dr. Wily, Eggplant Wizard, Pit, Wonder Momo added. 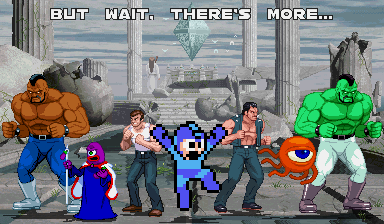 Abobo (new sprite), Joe Musashi (Shinobi 1 sprite added), Marian (new Double Dragon 1 sprite), Mega Man (new palette and re-sized NES sprites), Radd Spencer (new sprite) updated. Technos: new Marian sprite, new scratch-made Abobo sprite (to replace that crappy Hulk edit), slightly-modded/improved Lopar and Williams. Sprites – Kid Icarus (sprites and animations from the original NES/Famicom game added). Fake Screenshots – “Rokman (title screen)” was added. No, that’s not a typo. Mini-logos – Dr. Wily, Dr. Light and Dr. Right added to Capcom section. I’d like to thank everyone who has been enjoying the site this year, especially the those who have given feedback. Most of this year has been okay for me, but I’d randomly get some really good feedback right when I was feeling like a wet food stamp. You made me feel better and that caused me to push myself to make updates bigger (especially that Halloween update). I’d also like to thank those of you have been digging the Tumblr account I’ve used to show off weird things that didn’t quite have a spot on the site just yet or game-related thoughts that were rolling around in my head at the moment. What’s up for 2013: I’m not going to talk a bunch of smack only for it to not happen, so I’m going to stay quiet on it. All I’m going to say is that I’ve been working on a bunch of things I’ve wanted to show you for YEARS, huge chunks of it were finished in 2012 and, time willing, 2013 might be when some of it is done enough to show. Besides the fact that people will pretty much swipe anything that you post on the ‘net if you preview it before the main project is done, it really is better if you see some of this stuff in action first. For now, continue to have Happy Holidays, including a Happy New Year! 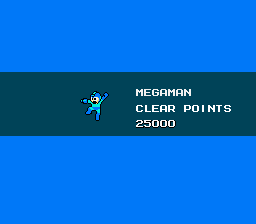 Happy 25th Anniversary, Mega Man! With this day being the 25th Anniversary of Rockman’s release in Japan, sites are celebrating everywhere, especially with release of the Street Fighter X Mega Man fan game. 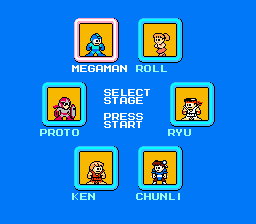 I was going to save this for the bigger update that’s on the way, but I can’t just let Mega Man’s birthday go uncelebrated here. This is a new generator that uses some fixes and improvements I made to the main GFX Generator engine. A few things still don’t work 100%, but I think you can still have some fun with it. I’ll make more Mega Man-style edits these if people tell me that they like this generator. Let me know if you like this generator and want to see more Mega-edits! There’ll be more Mega Man-related things in the “1987” update that will hit the site next week. edit (2012/12/17, 9:42 PM EST): Minor quick-fix to the resizer so that the smaller sprites aren’t shrunken to nothingness. Comments Off on Happy 25th Anniversary, Mega Man! I brought this up on Illmosis and I’m hoping to get a bit more help here, too. Raven Perez, writer/artist of hilarious, non-work safe comics like “Either Dojokes or Bacon Strips” and “Raven’s Dojo” has a Kickstarter for his comic and still needs help to hit his goal. He only has a few days left, but I still think he can do it. Raven’s Dojo has the same all-out craziness that makes so many older games fun to play, so I hope it appeals to you, too. Please help him out by contributing and/or spreading the word about his worthy project! 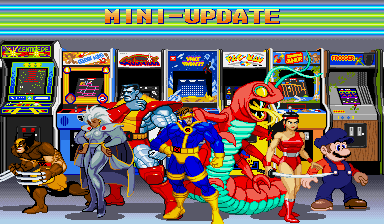 Here’s a small update that includes a few things tied to that Old-School update from November, improves some X-Men in the GFX Generators, and sets up things for the upcoming 1987 update. Updated screenstyles: Centipede background added to the GroupShot’s 160×192 set-ups. Sprites – Updates to Shinobi (sprites added, layout reformatted) gallery. Game Index – Ms. Pac-Man, Flashgal and Ghosts ‘n Goblins (arcade versions) were added. Shinobi (arcade) was in the system, but didn’t show up on the main game list for some reason. The website now has a Shop page. I’ve had a ScrollBoss store set up on my CafePress account for years, but never really put it on the site until now. Why? Because I made a design for it that’s something other than the ScrollBoss S symbol. Those who have visited the message board might recognize that. The F-Bomb shirt is sold through CafePress and is available in Men’s and Women’s modes. I’m also working on some things that will be sold as art prints, possibly on deviantART but definitely as part of my print collection at conventions.